Made in Poland with tve he highest accuracy and detail, light and comfy FullPrint Sweatshirt. Perfect, classic and thanks to your imagination extremely original at the same time. FullPrint Sweatshirt is made of modern material which combines durability of polyester and comfort of cotton. Thanks to it you can add your graphics on whole front panel of the product without losing any of your ideas. Sleeves and back panel are made of black, extremely pleasant cotton. Every piece of apparel is made in Poland and has the Trustworthy Fabrics Certificate of Polish Textile Institute. 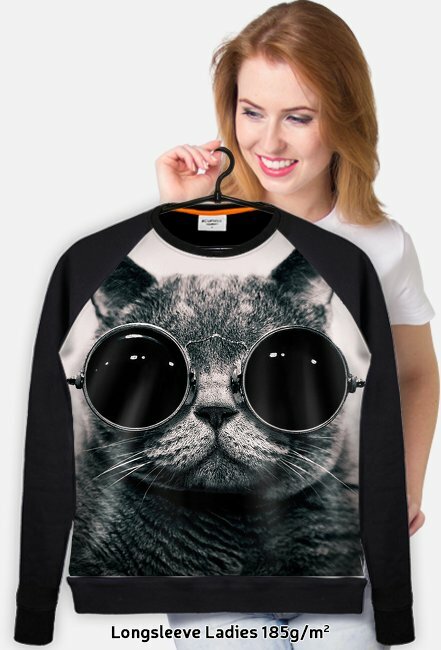 When we were designing FullPrint Sweatshirt we were searching for inspirations in modern fashion, but we did not want to move away from the classics. We have made the form so ideal that it can meet the requirements of everyone with any type of figure and can check out perfectly in every situation. We took care of every detail of the FullPrint Sweatshirt to meet your requirements. Cuffs, collar and down part are finished with stretch resistant cotton welt which is pleasant in touch. The collar is finished with nice and delicate string. Thanks to the FullPrint technology, front panel of the blouse can be completely covered by chosen print. Back panel can have maximum dimensions 30x40 cm and is proportionally adapted to size of the blouse in the context of chosen graphics and size, because everything needs to look perfect! You need to wash the sweatshirt in 30 degrees Celsius, do not use any strong chemicals and detergents, spin in low setting, do not dry in tumble dryers. Iron in low settings only. Avoid back panel during ironing if there is an overprint.